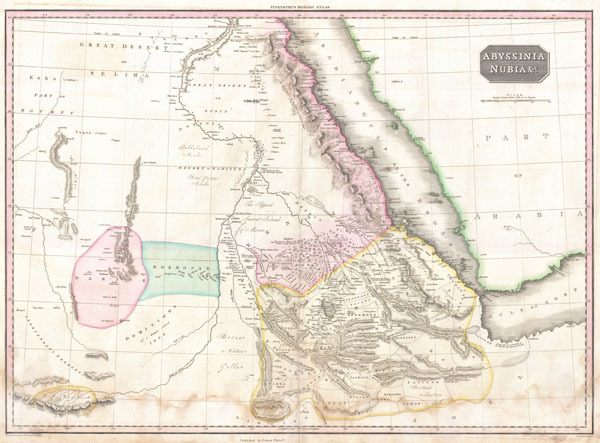 Pinkerton's extraordinary 1818 map of Nubia and Abyssinia. Covers from Darfur east to the Gulf of Aden and from Aswan south to Gingiro. Includes the modern day countries of Sudan, Ethiopia, and Eretria as well as parts of Djibouti, Kenya, Egypt, Yemen and Saudi Arabia. This map is centered on the southern reaches of the Nile River. Shows the division of the Nile in modern day Sudan between the White Nile, which flows slightly westward and the Blue Nile which flows slightly eastward. The Blue Nile had, by this time, been traced to its source, Lake Tana, in the relatively well mapped Christian kingdom of Abyssinia. The White Nile is shown originating the Mountains of the Moon in the extreme lower left quadrants of this map. The Mountains of the Moon were an apocryphal source for the Nile River speculated upon by as early as Herodotus but more commonly by the second century geographer Claudius Ptolemy. It is a curious decision on the part of Pinkerton to keep the Mountains of the Moon as a source of the White Nile, but abandon the associated lake theory that, ultimately proved to have some relation to reality. Pinkerton offers numerous interesting notes and commentary throughout. Near the split of the White and Blue Niles, Pinkerton correctly identifies the 'Supposed Ancient Island of Meroe' were today little known but magnificent ancient pyramids were built in imitation of the Egyptian work at Giza. Also notes the site where the 'Portuguese found King David Encamped in 1520' - no doubt referring to one of the many Abyssinian Kings of that name. Also notes the important desert caravan route, with its many oases, between Accad and Aswan. Upper right hand quadrant features title plate and a scale in British Miles. Drawn by L. Herbert and engraved by Samuel Neele under the direction of John Pinkerton. This map comes from the scarce American edition of Pinkerton's Modern Atlas, published by Thomas Dobson & Co. of Philadelphia in 1818. Good condition. Mild to moderate damp staining in lower quadrants. Original centerfold. Blank on verso. Rumsey 0732.58. Phillips (Atlases) 724. National Maritime Museum, 409.